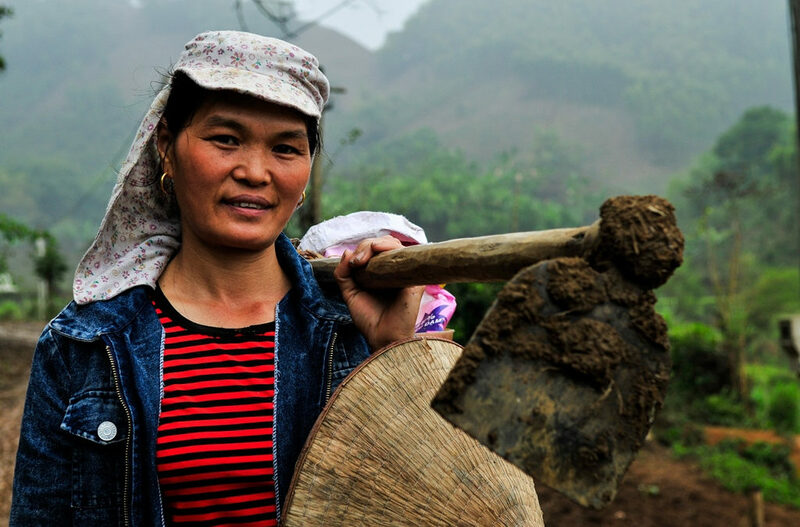 Confronted with dwindling yields as a result of prolonged droughts, bursts of heavy rain, and frequent cold snaps, farmers in Ma, a village in northern Vietnam, have been learning to use their precious resources so that nothing goes to waste. Hoāng Quōc Viet no longer disposes of buffalo dung by burning it; instead he treats it with effective microorganisms (EM) – chemical processing agents that increase a compost’s macro- and micronutrient content. Then he raises earthworms in the dung and feeds them to his chickens. He also uses the treated dung as fertilizer for his rice and cassava. He saves money on fertilizer and chicken feed, and the chickens, as well as the rice and cassava, grow very well. Tran Trung Kien stopped using chemical fertilizer on his home garden and over 200 fruit trees over a year ago. He mixes the same EM with cow dung and uses that instead. He has also started penning in his cattle to keep them from catching diseases when grazing, as well as to keep them from causing damage to crops. He plants grass to feed the cattle and to reduce erosion on sloping land. Nguyen Thi Thu has stopped burning rice stalks after harvest. She now sprays them with EM for use as fertilizer for next season’s rice. 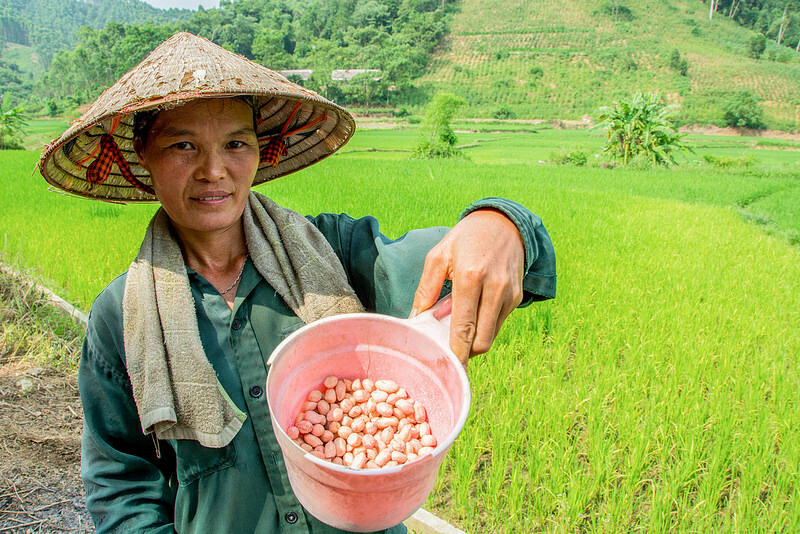 As well as saving money on fertilizer, she says her rice tastes sweeter, better. These are some of the technologies and practices selected by Ma farmers, through CIAT’s work with the CGIAR Research Program on Climate Change, Agriculture and Food Security (CCAFS). The objective is to test a range of complementary approaches that can help farmers become more resilient to climate risks, and make their farms more sustainable. They realized that something needed to be done: extreme and unpredictable weather had disrupted cropping patterns; fewer but more intense rains caused severe landslides, soil erosion and degradation; increased cold stress was killing more and more cattle each year; and new crop diseases were emerging. All of these have affected yields and incomes. From a “basket” of ten climate-smart agricultural (CSA) technologies and practices, farmers chose and prioritized those they felt were best suited to their needs. 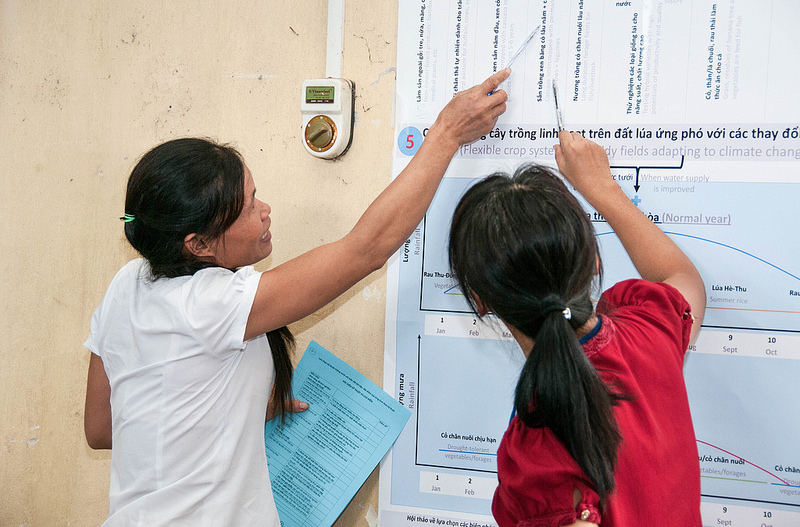 CIAT further refined the list through cost-benefit analysis and scenario testing, together with participatory land mapping exercises, to determine which ones would go to field trials, and how these should be implemented. A few more approaches have been found to be suitable and are now prioritized for testing. These include integrated home gardens, vermicomposting, raising poultry on a “living bed” of sawdust treated with EM to improve poultry health, and rice straw processing to make bio-fertilizer. Testing for several of these began in 2016; the rest will be tested in 2017. “Climate change is moving too quickly for the sequential testing of individual CSA practices. 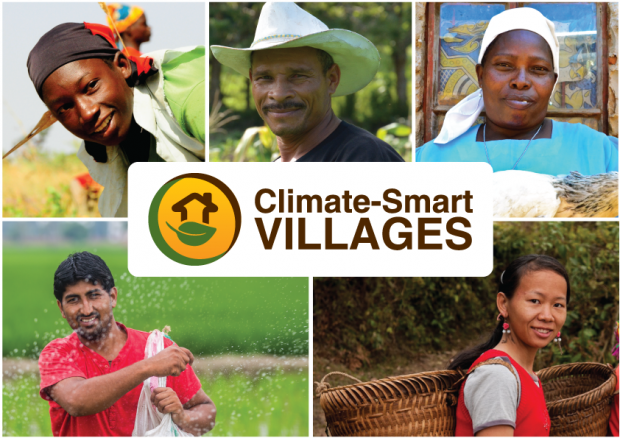 By bundling several together in climate-smart villages like Ma, we can help farmers move much more quickly towards sustainable farming systems that are more resilient and productive,” said CIAT’s Vinh Bui, a scientist and coordinator for the CCAFS climate-smart village project in Vietnam. 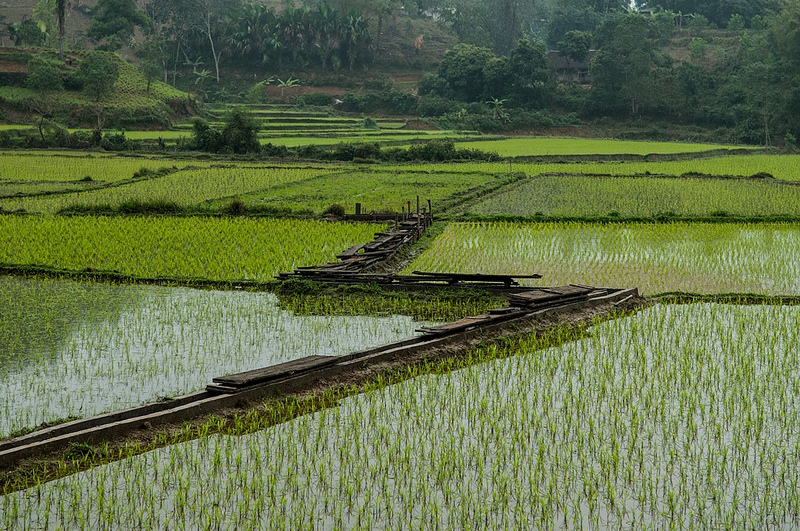 In 2016, CIAT launched a climate-smart agriculture (CSA) sourcebook, “Towards climate resilience in agriculture for Southeast Asia: an overview for decision-makers”, referencing a wide range of CSA practices and demonstrated technologies from over 700 sources. The Ma CSV action is performed within the frame of the CGIAR Research Program on Climate Change, Agriculture and Food Security (CCAFS).